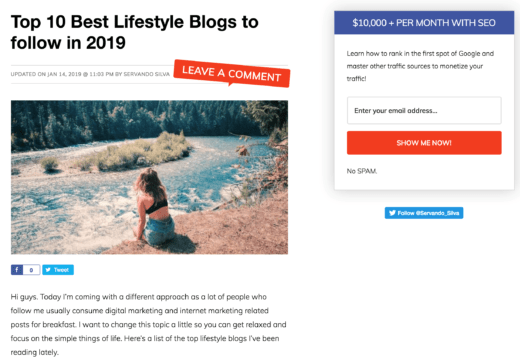 If you look at some of the most successful blogs in the world, you’ll notice one thing that they all share in common: Their main priority on the blog is to collect emails. 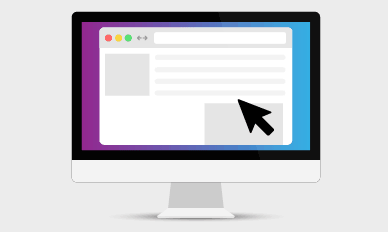 Some blogs will even turn their entire homepage into a dedicated landing page to collect your email. And if you click through to an inner page, you’ll see opt-in forms throughout. If you try and click away, you’ll likely be presented with a popup that asks you, again, for your email address. Yes, sometimes this can get annoying, but there’s a reason why this is happening. If you want to turn your blog into a sustainable business, building an email list is an absolutely critical part of the blogging business model. Every blog I build is revolved around list building. 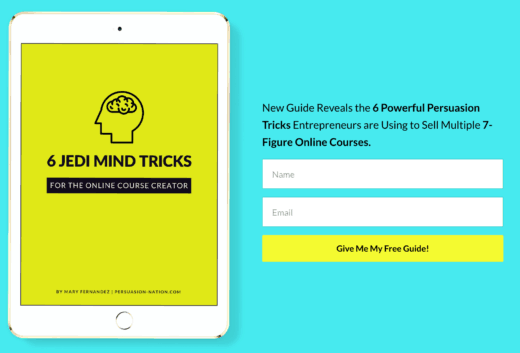 And in this guide, I’m going to show you how to get started with building your first email list from zero to 1000 subscribers, step-by-step. What is a blog’s purpose? But first, a question: What is a blog’s purpose? The answer to that is: To collect leads. A blog is a lead generation machine. The business model on the backend can differ from blog to blog and from industry to industry, but the blog itself exists to collect leads. That is its primary function and goal. And these leads are called… you guessed it, email subscribers. It is very important you understand this concept clearly so that you know why we’re doing what we’re doing in this tutorial. 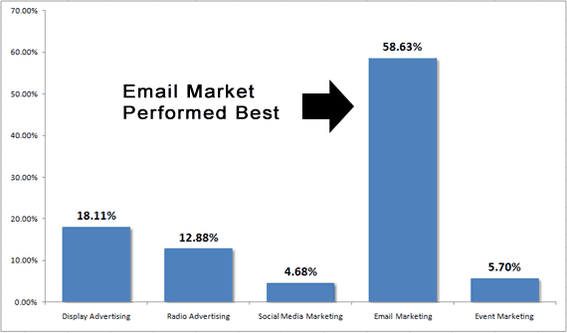 What Can You Do With Email Subscribers? The best part about an email list is that you have a giant Rolodex of fans, readers, and customers that you can reach out to over and over again. As an advertising channel, it outperforms social media and display advertising combined. Let’s look at some examples directly related to blogging. Let’s say that there are 2 blogs. Both have been active for several years, but one has been list building and the other hasn’t. If they publish a new blog post, the one without an email list has nobody to tell. They simply have to publish and hope that the existing traffic on the site clicks through and reads their new post. The one with an email list, on the other hand, can simply send out one broadcast email to their entire list. Immediately, they can send a flood of traffic to a brand new blog post. Now let’s say that both blogs decided to release a new product and run a product launch. Again, the one without an email list would simply have to hope that the existing traffic on the site clicks through and checks it out. Or they may decide to run paid ads to get some initial traffic to the page. The one with an email list simply has to send a broadcast email. Like in the last example, they immediately drive a flood of targeted warm leads to a sales page and can get instant sales. For most blogs, the traffic from an email list is all that they need to have profitable product launches. In a study, Convince and Convert found that people who buy products marketed through email spend 138% more than people who do not receive promotional emails. On top of that, 72% of consumers state that they prefer communications by email. Hopefully, now I have your peak interest. Now let’s learn how to build your own list and get your first 1000 subscribers. The first major milestone for any new blog is 1000 email subscribers. Once you hit this number, it’s safe to say your blog has “made it”. It can’t really be deemed a failure unless you just quit. 1000 email subscribers are enough to be considered a successful up and coming blog. As you can see, a blog’s success is directly related to the number of email subscribers it has. Usually, it’ll also be in line with how much money the blog makes as well. Usually, it’s safe to say that you can make an average of $1 per subscriber per month. That is a very loose estimation, though, as it can vary greatly depending on your industry, the level of engagement and of course, what you’re selling. For example, Backlinko recently revealed that he made $100,000 from his first product launch with only a 2000 person email list. To get started, you’re going to need three things. An email service provider is a tool that allows you to collect, store, and send emails to your email list. There are many options out there but if this is your first time, I would suggest you use MailChimp. It is the only company that offers a free plan up to 2000 email subscribers. You can use them until you hit the next paid tier, and then decide if you want to pay them or move to another company. An email marketing tool will allow you to create nice looking forms to collect emails from. You don’t absolutely need to spend money on a tool since most basic forms are built into MailChimp. But it does offer you a lot more types of forms, customization, and design and optimization options. A tool that I like to use is Sumo. 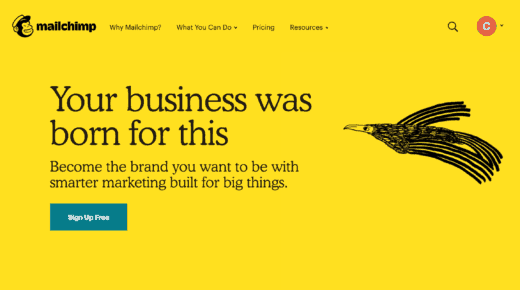 Sumo costs around $25/month to start so if that’s an issue, just use the built-in forms from within MailChimp to start. Once you have these setup, you can start collecting emails on your blog. But you’ll need an opt-in incentive first. An opt-in incentive is something that you offer in return for someone’s email address. Most new blogs tend to just start with something like “Get Updates – enter your email to get updates from our blog.” That’s not a very attractive opt-in incentive, and you won’t have very high conversion rates doing that. Instead, here are two options that work better. A free ebook: Create an ebook around a relevant topic that’s of high interest in your industry. Creating it is easy. Simply create it in a word processor like Google Docs and then save it as a PDF. A cheatsheet: This is much easier and faster to make than an ebook. A cheat sheet is usually a 1-2 page document with condensed bullet points. For example: “A Keto Diet Cheatsheet”. These opt-in incentives shouldn’t take you more than a day to put together. If this is your first time creating one, then don’t get too worried about the fine details. Some of the most successful blogs in the world use very basic opt-in incentives that were pretty much just typed out in Microsoft Word. There is so much you can do with how you collect emails. You can turn your homepage into a landing page, use popups, have forms in the sidebar and footer, have a form under your header. The options are endless and you can test out what works best for your blog over time. For me, I’m continuously optimizing my blogs to get higher and higher conversion rates. If you have a brand new blog, the best place to start is to simply use a popup, sidebar form, and a dedicated landing page. This is the perfect combination to get started with. 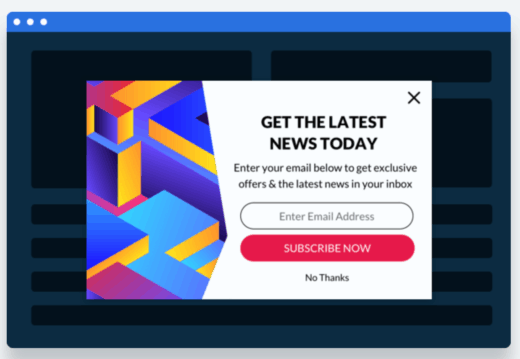 For popups, make sure to use one that offers exit-intent technology. Exit-intent popups only show when visitors are about to hit the back button and leave the page. This drastically increases conversion rates over a conventional popup, and also makes it less annoying for visitors of your blog. A dedicated landing page is simply a full page that asks for someone’s email. The only goal of that page is to collect someone’s email in return for your opt-in incentive. Here’s an example from James Clear. As you can see, there are no distractions on the page. The only thing anybody can do is enter their email address or hit the back button. These convert very highly, so I recommend linking to this page from your header menu and from within your blog posts whenever you have the chance. This is the most common way people collect emails. Most blogs have forms in their sidebar. Sidebar forms don’t convert as high as popups and dedicated landing pages, but it’s still a great way to have an easy access form that people can see on every page. These three forms should be enough to get you started collecting your first emails. I have tried a ton of different opt-in forms for my blogs, and these are the ones that I like to start with as a base. As your traffic grows, you can start experimenting with other types and swap out ones that aren’t converting as highly. You want to find the right balance so that you’re getting a good conversion while not spamming people. What Emails Should I Be Sending? This is one of the most frequently asked questions from people who are new to email marketing. Later on down the road, when your blog is more complex and has more offerings, you can implement things like evergreen sales funnels or a lengthy autoresponder newsletter. For a brand new blog, there is only one type of email you should be sending: Updates on new blog posts. Whenever you publish a new blog post, send your list an email notifying them and link to the blog post from within it. This helps drive consistent traffic to your blog, and increases comments, shares and links to your new page. But most importantly, it helps you keep your list warm. It allows you to stay in touch with email list while sending them helpful content. What you don’t want to do is collect someone’s email and then never reach out to them for months. They’ll quickly forget who you are. You want to establish a connection with each subscriber so that when they see your name in their inbox, they immediately know who you are. Sending them free content like this will also help in them associating you with value. You’re not selling in every email, but you’re helping them. This will make it better received when you finally do have something to sell. How often should you be sending emails? Anywhere between twice a month to twice a week is a good guideline. It will depend on how often you publish and how often you have something to email them about. How Long Should It Take To Get My First 1000 Email Subscribers? One month to six months is a good guideline for the timeframe. How fast it will take will really depend on how good you are at getting traffic to your blog. If you’re promoting your blog posts well, you can easily get your first 1000 email subscribers in a single month. Many blogs have done this. If not, you should shoot for 3-6 months. That is plenty of time, and it shouldn’t be taking you any longer if you are actually working hard at hitting this milestone. Okay, So I Have 1000 Email Subscribers. Now What? So you hit 1000 email subscribers. Congratulations! This is officially the first big milestone in any blog’s lifespan. Hitting this first milestone is the most difficult part. From here, it gets easier and easier, especially as your organic traffic begins to grow. What I like to recommend to people is that they create and launch their first paid product when they hit 1000 email subscribers. For most people, this will be the first time they make significant revenue from their blog. What you create and launch, and how you price it will really depend on the niche your blog is in. In most cases, a small product under $500 is a good starting point. As your list grows larger and larger, your product launches will get bigger as well. Some of the biggest blogs in the world have reported 6 and 7 figure launch weeks. Of course, they have 100,000+ email subscribers on their list. But that’s our goal as well. And getting to our first 1000 subscribers is the first major starting point in our journey.